Every AWS resource is owned by an AWS account, and permissions to create or access a resource are governed by permissions policies. An account administrator can attach permissions policies to IAM identities (users, groups, and roles), and some services (such as Amazon SQS) also support attaching permissions policies to resources. An account administrator (or administrator user) is a user with administrative privileges. For more information, see IAM Best Practices in the IAM User Guide. When granting permissions, you specify what users get permissions, the resource they get permissions for, and the specific actions that you want to allow on the resource. You can get the ARN value for an existing queue by calling the GetQueueAttributes action. The value of the QueueArn attribute is the ARN of the queue. For more information about ARNs, see IAM ARNs in the IAM User Guide. Amazon SQS provides a set of actions that work with the queue resource. For more information, see Actions and Resource Reference. If you use the root account credentials of your AWS account to create an Amazon SQS queue, your AWS account is the owner of the resource (in Amazon SQS, the resource is the Amazon SQS queue). If you create an IAM user in your AWS account and grant permissions to create a queue to the user, the user can create the queue. However, your AWS account (to which the user belongs) owns the queue resource. If you create an IAM role in your AWS account with permissions to create an Amazon SQS queue, anyone who can assume the role can create a queue. Your AWS account (to which the role belongs) owns the queue resource. A permissions policy describes the permissions granted to accounts. The following section explains the available options for creating permissions policies. This section discusses using IAM in the context of Amazon SQS. It doesn't provide detailed information about the IAM service. For complete IAM documentation, see What is IAM? in the IAM User Guide. For information about IAM policy syntax and descriptions, see AWS IAM Policy Reference in the IAM User Guide. 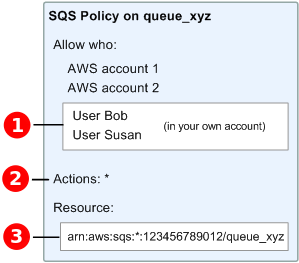 Attach a permission policy to a user or a group in your account – To grant user permissions to create an Amazon SQS queue, attach a permissions policy to a user or group that the user belongs to. Attach a permission policy to a user in another AWS account – To grant user permissions to create an Amazon SQS queue, attach an Amazon SQS permissions policy to a user in another AWS account. The account A administrator creates an IAM role and attaches a permissions policy—that grants permissions on resources in account A—to the role. The account A administrator attaches a trust policy to the role that identifies account B as the principal who can assume the role. The account B administrator delegates the permission to assume the role to any users in account B. This allows users in account B to create or access queues in account A. If you want to grant the permission to assume the role to an AWS service, the principal in the trust policy can also be an AWS service principal. While Amazon SQS works with IAM policies, it has its own policy infrastructure. You can use an Amazon SQS policy with a queue to specify which AWS Accounts have access to the queue. You can specify the type of access and conditions (for example, a condition that grants permissions to use SendMessage, ReceiveMessage if the request is made before December 31, 2010). The specific actions you can grant permissions for are a subset of the overall list of Amazon SQS actions. When you write an Amazon SQS policy and specify * to "allow all Amazon SQS actions," it means that a user can perform all actions in this subset. The following diagram illustrates the concept of one of these basic Amazon SQS policies that covers the subset of actions. The policy is for queue_xyz, and it gives AWS Account 1 and AWS Account 2 permissions to use any of the allowed actions with the specified queue. 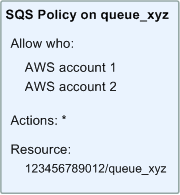 The resource in the policy is specified as 123456789012/queue_xyz, where 123456789012 is the AWS Account ID of the account that owns the queue. With the introduction of IAM and the concepts of Users and Amazon Resource Names (ARNs), a few things have changed about SQS policies. The following diagram and table describe the changes. In addition to specifying which AWS Accounts have access to a queue, you can specify which users in your own AWS account have access to the queue. If the users are in different accounts, see Tutorial: Delegate Access Across AWS Accounts Using IAM Roles in the IAM User Guide. The subset of actions included in * has expanded. For a list of allowed actions, see Actions and Resource Reference. You can specify the resource using the Amazon Resource Name (ARN), the standard means of specifying resources in IAM policies. For information about the ARN format for Amazon SQS queues, see Amazon Simple Queue Service Resource and Operations. For example, according to the Amazon SQS policy in the preceding diagram, anyone who possesses the security credentials for AWS Account 1 or AWS Account 2 can access queue_xyz. In addition, Users Bob and Susan in your own AWS Account (with ID 123456789012) can access the queue. Before the introduction of IAM, Amazon SQS automatically gave the creator of a queue full control over the queue (that is, access to all of the possible Amazon SQS actions on that queue). This is no longer true, unless the creator uses AWS security credentials. Any user who has permissions to create a queue must also have permissions to use other Amazon SQS actions in order to do anything with the created queues. The following is an example policy that allows a user to use all Amazon SQS actions, but only with queues whose names are prefixed with the literal string bob_queue_. For more information, see Using Identity-Based (IAM) Policies for Amazon SQS, and Identities (Users, Groups, and Roles) in the IAM User Guide. Other AWS services, such as Amazon S3, support resource-based permissions policies. For example, to manage access permissions for an S3 bucket, you can attach a policy the S3 bucket. Amazon SQS doesn't support resource-level permissions in identity-based policies (attached to a user or role), in which you can specify resources on which users are allowed to perform specified actions. For more information, see Overview of AWS IAM Permissions in the IAM User Guide. For each Amazon Simple Queue Service resource, the service defines a set of actions. To grant permissions for these actions, Amazon SQS defines a set of actions that you can specify in a policy. Performing an action can require permissions for more than one action. When granting permissions for specific actions, you also identify the resource for which the actions are allowed or denied. Resource – In a policy, you use an Amazon Resource Name (ARN) to identify the resource to which the policy applies. Action – You use action keywords to identify resource actions that you want to allow or deny. For example, the sqs:CreateQueue permission allows the user to perform the Amazon Simple Queue Service CreateQueue action. Effect – You specify the effect when the user requests the specific action—this can be either allow or deny. If you don't explicitly grant access to a resource, access is implicitly denied. You can also explicitly deny access to a resource, which you might do to make sure that a user can't access it, even if a different policy grants access. To learn more about Amazon SQS policy syntax and descriptions, see AWS IAM Policy Reference in the IAM User Guide. For a table of all Amazon Simple Queue Service actions and the resources that they apply to, see Actions and Resource Reference. When you grant permissions, you can use the Amazon SQS Access Policy Language to specify the conditions for when a policy should take effect. For example, you might want a policy to be applied only after a specific date. For more information about specifying conditions in a policy language, see Condition in the IAM User Guide.